How do the Washington Nationals feel about Bryce Harper leaving the team during the offseason? The team’s strategy for its first game against the Philadelphia Phillies may shed some light on its thoughts. For Harper’s return to Washington, D.C., the Nationals have decided to bring back Max Scherzer a day early. While Scherzer will be on five days’ rest, the spot was supposed to go to the team’s fifth starter. Instead, the Nationals will forego their fifth starter for this turn in the rotation and give Scherzer the honor of spoiling Harper’s first game back. Scherzer threw 109 pitches during Thursday’s 2-0 loss to the New York Mets. The 26-year-old Harper has never faced the 34-year-old Scherzer during his career. The two weren’t teammates until Harper’s fourth season in Major League Baseball. Since Scherzer played in the American League at the time, they never met during Harper’s first three seasons. Seeing the two former teammates finally go head-to-head should provide plenty of excitement for Nationals fans. They’ll get to see the best pitcher in baseball take on one of their former stars. Given Scherzer’s intensity on the mound, that first at-bat could be quite a spectacle. 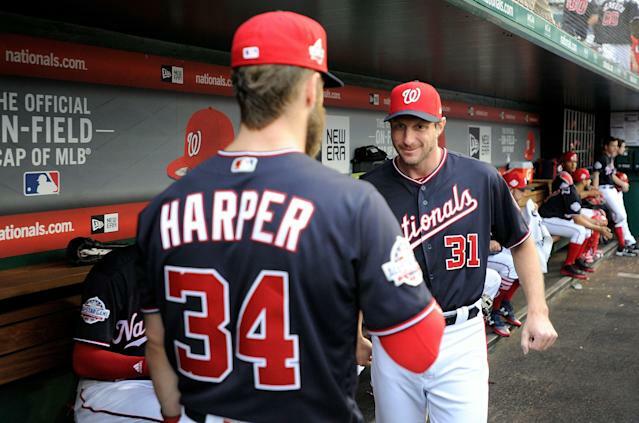 The novelty of Scherzer and Harper facing off will likely wear off soon. With Harper in Philadelphia long-term, Scherzer and the Nats should have plenty of opportunities to try and shut Harper down for the next 13 seasons. After watching Scherzer dominate opponents for years, Harper is finally going to challenge him. That first at-bat should be must-see television for baseball fans.